Non Uniform Rational B-Splines (NURBS curves) play an important role in CAD design, as they are the only popular tool allowing to represent true circles, something that is and always has been the base of subdivision surface modelers. T-Splines is a powerful solution, and was available as a plugin for the popular NURBS Rhino modeling application. Its ability to couple the organic, freeform approach of subdivision surface modeling with the precise mechanical properties of NURBS curves quickly created a massive buzz around this solution. 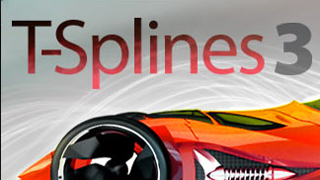 Today, on December 22nd, Autodesk, leader in 3d CAD modeling, announced that has acquired T-Spline technology. As of today, T-Splines' web site has a "transitioning" notice in place of the add to cart button. According to Autodesk's statement, this acquisition will strengthen the Digital Prototyping solutions, and the computer graphics community is already speculating if T-Splines technology could be adapted to Maya's NURBS modeling, effectively bridging the subdivision surface and curve based modeling tools found in Autodesk's popular 3D animation package.